Tropical Depression Emily is moving out over the Atlantic early Tuesday, a day after slogging across the Florida peninsula, where it brought drenching rain and power outages. The U.S. National Hurricane Center says the depression’s maximum sustained winds are near 30 mph. Forecasters say slight strengthening is possible during the day but the poorly-organized depression is expected to stop being a tropical system within a day or two. The depression is centered about 50 miles north-northeast of Vero Beach, Florida, and is moving east-northeast near 12 mph. “Emily’s rain shouldn’t prompt Lake Okeechobee discharges, expert says” via Tyler Treadway of TCPalm – The 2 to 3 inches of rain over a wide swath south of Orlando could raise the lake level about 6 inches, said Paul Gray, a Audubon Florida scientist who’s been studying the lake environment for decades. The lake elevation Monday morning was not quite 12 feet 9 inches, which is about a foot lower than the average for the end of July. “Even with all that rain from Emily, the lake level would still be below the average for this time of year,” Gray said. “Luckily, the drought this spring brought the lake way down and gave it a lot of capacity to hold more water without getting too high.” Emily was a tropical storm when it made landfall Monday afternoon but was downgraded to a tropical depression by 5 p.m.
“Emily’s surprise: Ingredients were there for quick-forming tropical storm” via Tony Marrero of the Tampa Bay Times – Though the forces at work in Emily’s rapid development are familiar, experts said they came together in a way that fooled the mostly highly-regarded computer forecast model and highlighted how unpredictable Mother Nature can be. Emily began as a so-called cold-core frontal low, a type of weather front familiar this time of year, said Stacy Stewart, senior hurricane specialist at the National Hurricane Center in Miami. These kinds of fronts typically span many hundreds of miles and have a large circulation and wind radius. That means it takes days for the heat generated by thunderstorms to warm up the front’s inner core, which causes the pressure to drop and wind speeds to increase. When this happens, the front can transition to a so-called warm-core tropical low, which can develop into much stronger storms — including cyclones. The frontal low that spawned Emily was unusually small, about 150 miles in diameter, meaning it required relatively few thunderstorms to warm up its core … “We get one or two storms a year that form like this, but not this quickly,” Stewart said. 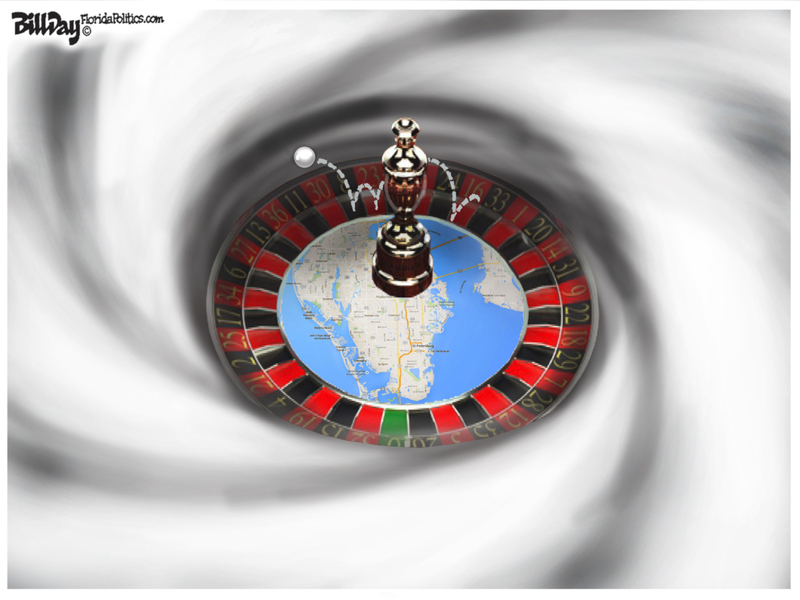 Must read – “Tampa Bay is due for a major hurricane. It is not prepared.” via Darryl Fears of The Washington Post – A Boston firm that analyzes potential catastrophic damage reported that the region would lose $175 billion in a storm the size of Hurricane Katrina. A World Bank study called Tampa Bay one of the 10 most at-risk areas on the globe. Yet the bay area — greater Tampa, St. Petersburg and Clearwater — has barely begun to assess the rate of sea-level rise and address its effects. Its slow response to a major threat is a case study in how American cities reluctantly prepare for the worst, even though signs of impacts from climate change abound all-around. The sea in Tampa Bay has risen naturally throughout time, about an inch per decade. But in the early 1990s, scientists say, it accelerated to several inches above normal, so much that recent projections have the bay rising between 6 inches and more than 2 feet by the middle of the century and up to nearly 7 feet when it ends. On top of that, natural settling is causing land to slowly sink. Sea-level rise worsens the severity of even small storms, adding to the water that can be pushed ashore. Hard rains now regularly flood neighborhoods in St. Petersburg, Tampa and Clearwater. “Rick Scott says Floridians pay far more into flood insurance than they get back in claims” via Amy Sherman of PolitiFact – Scott said “Over the past 35 years, Florida families have paid into the NFIP (National Flood Insurance Program) over $16 billion, four times more than the amount they have received in claim reimbursements.” A study from the Wharton Center concluded that Florida’s “policyholders paid $16.1 billion in premiums but collected only $4.5 billion in claims reimbursements: that is, premiums paid over time were about 3.6 times the insurance reimbursements.” That statistic from the study covered 1978-2008, but it’s likely the trend has continued through 2012. The only key point that Scott omits is that this imbalance is common: Lots of states pay more in premiums than they receive in claims. A major storm could change that dynamic, and the purpose of insurance is to protect against such an event. We rate this claim Mostly True. Meanwhile … “State adds three ‘travel related’ Zika cases” via the News Service of Florida – … bringing to 116 the number of reported cases of the mosquito-borne virus this year, according to numbers on the state Department of Health website. State numbers a week earlier showed 113 cases. The state does not have any areas where ongoing transmission of the virus is occurring … But incidences of infected people bringing the virus into the state – known as “travel related” cases – continue to increase. The new numbers show 88 travel-related infections reported this year. Another 22 cases involve people who were exposed to Zika in 2016 and tested in 2017, with the nature of the exposures listed as “undetermined.” Another six cases involve people who were infected in the state in 2016 and tested in 2017. Zika is particularly dangerous to pregnant women because it can cause severe birth defects. “’Open carry’ advocates ask Adam Putnam: Where have you been?” via Steve Bousquet of the Tampa Bay Times – Putnam is talking a lot about a “pathway” to an open carry gun law in Florida as he chases the Republican nomination for governor … But his vocal support for an open carry law surprises people who have actually pushed for it in Tallahassee. Two leading open carry supporters, Sen. Greg Steube and former Senate President Don Gaetz can’t recall Putnam ever helping them get the bill passed. “Zero,” Gaetz said of Putnam. “He didn’t help and he didn’t hurt. He played no role in moving the bill. He never called me or approached me about the bill or offered to help.” Steube filed open carry (SB 140) in the 2017 session, and the bill was seven words long. Steube has no recollection of Putnam trying to help pass the bill. “This is the first I’m hearing of him taking a position on it,” Steube told the Times/Herald. Citing Putnam’s “pathway” comments, Steube said: “Prior to that, I didn’t know what his position was.” Neither Steube nor Gaetz is supporting a candidate for governor. “Matt Haggman, who may run for Ileana Ros-Lehtinen’s seat, to make ‘special announcement’ Tuesday” via Alex Daugherty and Patricia Mazzei of the Miami Herald – Two weeks ago, Haggman quit his post as the Knight Foundation’s program director in Miami, telling a reporter to “stay tuned” about his future plans. And now Haggman is hosting an event dubbed “Building a Better Miami” where he promises a “special announcement,” according to an invitation obtained by the Miami Herald. If Haggman jumps in the race for Ros-Lehtinen‘s seat he will become the sixth Democrat aiming for the Miami-based seat that Democrats argue is likely to flip after Ros-Lehtinen announced her retirement in April. Tony Cartwright files to run in HD 4 — Libertarian Ton Cartwright has filed to run against Rep. Mel Ponder in House District 4 in 2018. LobbyTools Legislative IQ reports that Carwright flew F-15 fighter jects in the Air Force after graduating from the University of Memphis. After finishing his active duty career at Eglin Air Force Base, he joined the United States Air Force National Guard and serves as a part-time operational test pilot. He currently works as a civilian at the base, advising on F-15 test programs. Ponder, a Destin Republican, was first elected in 2016. First in Sunburn – Wyman Duggan entering HD 15 race — The invisible primary to replace Jay Fant in Jacksonville’s HD 15 has been won by local insider Wyman Duggan. Duggan was urged to run by Mayor Lenny Curry and Curry’s political team ​(Tim Baker as consultant, Brian Hughes as comms) is on board. Fant is “AG or bust” in 2018, which denotes laudable commitment, but could leave him without a chair when the music stops … unless he wants to run for an open City Council seat (Jim Love in Fant’s home District 14 would be termed out in 2019). Duggan briefly ran in 2012 for state Senate, but lost the money race to eventual winner Aaron Bean. Duggan won’t lose this money race — he will have a finance team no other hopeful can match. 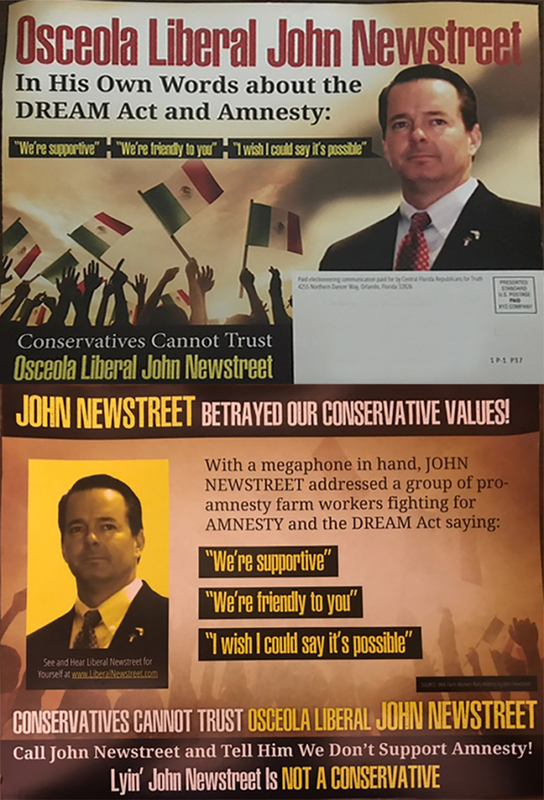 “Direct mail round-up: John Newstreet branded as ‘Osceola Liberal’” via Florida Politics –The direct mail campaign attempts to brand the Kissimmee/Osceola County Chamber of Commerce CEO as an “Osceola Liberal” who supports amnesty for illegal immigrants and backs the DREAM Act. The mailers, sent out by the Jacob Milich-chaired Central Florida Republicans for Truth, are peppered with quotes by Newstreet seemingly supporting an open-door immigration policy. “With a megaphone in hand, JOHN NEWSTREET addressed a group of pro-amnesty farmworkers fighting for Amnesty and the DREAM Act,” the ad reads, before attributing “we’re supportive,” “we’re friendly to you” and “I wish I could say it’s possible” to Newstreet. One side of the mailer asserts “conservatives cannot trust” the former aide to U.S. Sens. Mel Martinez and Marco Rubio, while the other says he “betrayed our conservative values” and gives him the Trumpian nickname “Lyin’ John Newstreet.” Newstreet is one of four Republicans running in the special election for HD 44. “Two west Orange County mayors yank support for Bobby Olszewski in HD 44 race” via Scott Powers of Florida Politics – Windermere Mayor Gary Bruhn and Ocoee Mayor Rusty Johnson announced in an open letter that they are withdrawing their endorsements of Olszewski because of concerns over his commitment to the home rule paradigm that assumes cities and counties should have the rights to govern as they see fit. The pair of mayors blasted Olszewski for supporting term limits for local offices, and stating in campaign fliers that as a state representative he would push for term limits. Those fliers also called for ethics reform legislation that would address “secret government contracts” and increase the lobbying ban for local officials. Olszewski responded by doubling-down on that position, and challenging his opponents to state their positions on term limits. “Republican emerges for Mark Miller House seat” via the News Service of Florida – With state Rep. Mike Miller running for Congress, a Republican candidate has emerged to try to succeed him in the Florida House. Winter Park Republican Stockton Reeves has opened a campaign account to run next year in Orange County’s House District 47 … Orlando Democrat Anna Eskamani opened an account for the race in early July. Save the date: Berny Jacques will hold a fundraiser for his House District 66 campaign at 6 p.m. on Aug. 16 at Intermezzo Coffee & Cocktails, 1111 Central Ave. in St. Petersburg. “Conservative group files complaint against Debbie Wasserman Schultz in Imran Aman case” via Amy Sherman of the Miami Herald – The Foundation for Accountability and Civic Trust filed a complaint … “There is something quite amiss as to why Congresswoman Debbie Wasserman Schultz continued to use taxpayer funds to employ former technology staff member, Imran Awan, even months after he was barred from accessing the House’s computer systems and a number of her colleagues severed ties with Awan,” said Matthew Whitaker, Executive Director of FACT. “Since Awan’s arrest last week, Wasserman Schultz has been evasive and unable to answer even basic questions about the nature of Awan’s employment with her office. This only further confirms the urgency of an investigation into her unethical and illegal actions.” While other Democratic members of Congress who had employed Awan quickly severed ties after the investigation came to light, Wasserman Schultz didn’t fire Awan until he was arrested July 25 for bank fraud. “Gov. Scott’s promise to fight for Obamacare repeal has stalled” via Amy Sherman of the Miami Herald – Scott vowed during his first campaign in 2010 to fight to repeal the federal law. We have been tracking his progress on our Scott-O-Meter, which tracks dozens of Scott’s campaign promises. Scott’s promise stalled during Obama‘s tenure but the election of Trump, a Scott ally, gave the pledge new potential. Scott has met with Trump and members of his administration multiple times urging repeal of the law, prompting us to move up his promise to In the Works. It is unclear when or if the Senate will be able to muster enough votes to repeal Obamacare or take any other significant steps related to the health care law. Scott has about a year and a half to continue to advocate for repeal until his term as governor expires in January 2019. For that reason, we’re moving our rating of Scott’s promise to fight for repeal of Obamacare to Stalled. Francis Rooney and Mario Diaz-Balart want more money for Everglades” via Alexandra Glorioso and Ledyard King of the Naples Daily News – But the two congressmen who represent Collier County said their hands are tied due to a budget process that gives the president ultimate authority on the U.S. Army Corps of Engineers’ budget. “We got everything we asked for and everything the president asked for in this budget,” Rooney said at Picayune Strand State Forest during a news conference with Diaz-Balart. “Now it wasn’t everything we were hoping the president would ask for, but the appropriators can only give us the maximum that the White House asks for.” Congress can’t appropriate more funds for specific projects than the president allocates in his budget. The Republican-controlled Congress banned such earmarks several years ago as a way to control government spending. All it can do is provide more funding to an agency or a program in the hopes that the extra money will find its way to local priorities. “David Barnes: To lower college tuition; get the government out of the way” for Florida Politics – Few issues resonated more with young people during last year’s presidential election than the idea of “free college.” After all, with tuition costs at an all-time high and many recent college graduates saddled with tens of thousands of dollars in student loan debt, millennials are looking for a financial lifeline. What to do? Well, according to some, the problem is stingy state governments. The less the state chips in, the more expensive college becomes. Known as “state disinvestment,” it’s a theory that has a number of high profile supporters and seems very logical at first glance. Unfortunately for big government proponents, it’s not that simple. New research from the American Enterprise Institute, a free market think tank, found scant evidence for the idea that in-state public colleges and universities give students a break on tuition when government increases their funding. If lawmakers truly want to help young Americans better afford higher education, they should start by introducing real choice and competition into the system, instead of more subsidies. Reforming the accreditation process, which discourages innovation and crowds out newer, smaller institutions that can’t afford the costly and burdensome process, will bring less costly alternatives that give better value than a four-year degree. “Kent Fuchs: Yes, college is a good thing for America and Americans” for the Tampa Bay Times– At a time our country seems more divided than ever, America’s colleges and universities still offer young people an opportunity to find common ground and grow together — two things on which the very future of the nation may depend. The need to point this out crystallized for me with the recent release of new findings from the Pew Research Center showing that a majority of Republicans and Republican-leaning independents (58 percent) believe colleges and universities are bad for the country. Although the poll shows a majority of Americans overall (55 percent) still think college is a good thing, the fact that a significant and growing part of our population doesn’t is alarming. 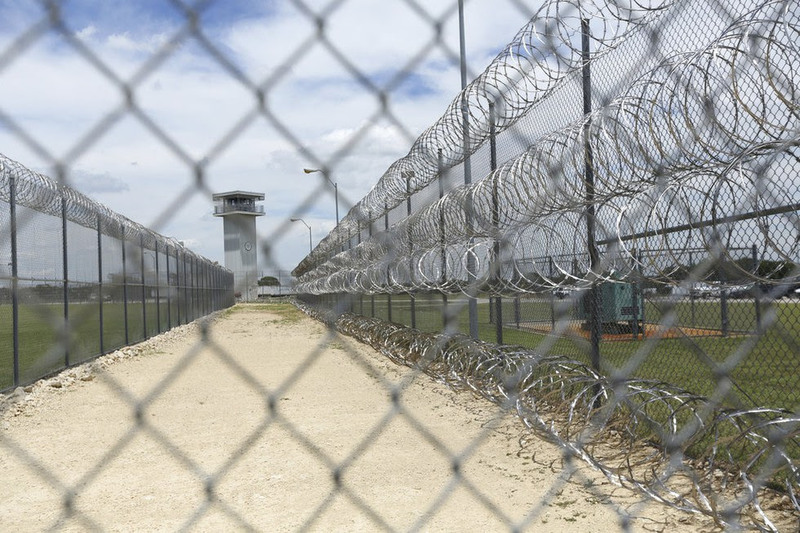 Barbed wire surrounds the prison that holds Jason Robinson, 39, in Gatesville, Texas. Robinson was convicted of murder at 16. Photo credit: AP. — Florida has roughly 600 inmates whose life sentences for homicide are potentially affected by court rulings mandating a second look at the punishment of juvenile offenders, but most still await a shot at resentencing. — So far only about 85 of those inmates have been resentenced. — The slow pace stems from various factors. A lack of money has kept some prosecutors and public defenders from revisiting cases quickly. Some elected prosecutors have adapted more rapidly than others to the mandated reviews. 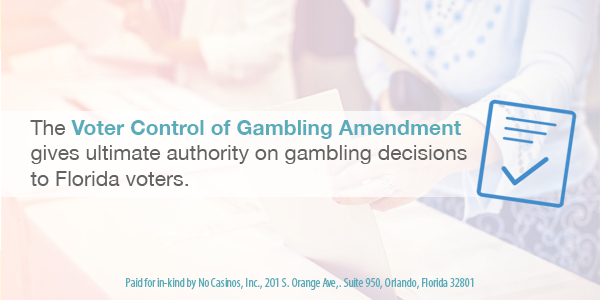 And state courts have struggled to figure out which types of sentences comply with the rulings. — In addition to the 85 homicide offenders already resentenced, about 80 others imprisoned for life in nonhomicide cases have received new terms. — Public defenders asked legislators this year for nearly $8 million to tackle all the case reviews, but the request was rejected. “Florida’s first responders to child abuse overwhelmed, inexperienced” via Olivia Hitchcock of the Palm Beach Post – A dozen former and current Florida Department of Children and Families child-protective investigators in Palm Beach County [say] that an inundation of paperwork, an ever-expanding job description and a ballooning number of cases have led to what some are calling a “mass exodus” of investigators statewide. “Out all night, up all day, you aren’t getting any sleep. How can you make a sound decision about a child’s safety?” a current investigator said. At one time or another in 2016, nearly every investigator in Palm Beach County juggled more cases than state policy recommends they should, an analysis of data provided by the state shows. In fact, some investigators handled more than double the recommended caseload — 15 — at one point in 2016, data show. “Palm Beach County commissioners move to end moratorium on pot shops” via Jeff Ostrowski of the Palm Beach Post – Lake Worth is the only locale in Palm Beach County to welcome medical marijuana dispensaries for now, but that’s about to change. Palm Beach County commissioners pushed forward the process of setting rules for pot shops in unincorporated areas. County commissioners set Aug. 24 as the date of a first reading of a proposed ordinance for medical marijuana dispensaries. The final reading would come Sept. 28. Now, the county says, it’s poised to end that moratorium and allow cannabis retailers to operate. A state law passed in late June says dispensaries must be at least 500 feet from elementary and secondary schools, but some Florida municipalities already had begun to approve cannabis retailers. “Board to consider applications for PSC seats” via Florida Politics – The Public Service Commission Nominating Council, the panel that vets and recommends candidates to Gov. Rick Scott, will meet twice this month to select finalists for the three openings on the commission, which regulates investor-owned utilities. An Aug. 9 meeting in Tampa is set for selecting the “most qualified” applicants to be interviewed, with the interviews themselves to be held Aug. 17 in Orlando, with a vote on the finalists by the end of that meeting. Commissioners Art Graham and Ronald Brisé have reapplied for their seats; their latest terms are expiring. The council also will look at applicants, including former state Comptroller Bob Milligan, to finish the rest of the term of former Commissioner Jimmy Patronis, who stepped down to become Florida’s new CFO. Scoop – “Jason Altmire to depart Florida Blue in advance of new book” via Florida Politics – Former Democratic U.S. Rep. Altmire says he’s leaving Florida Blue to promote his new book on political polarization, “Dead Center,” to be published this fall. “You only get one chance to do it right on something like this, so I’m going to go all out to promote it and see where it leads,” he told Florida Politics. “I’m really excited. It will be an adventure and the timing is perfect.” His last day with Florida Blue will be next Friday. Altmire, a Keystone State native and known as a centrist Democrat, represented the 4th Congressional District in western Pennsylvania. “New leader picked for South Florida Water District” via Jim Turner of the News Service of Florida – … replacing Pete Antonacciwho is leaving to become Gov. Scott‘s top business recruiter. The district’s Governing Board unanimously agreed during a teleconference to promote Ernie Marks, district director of Everglades policy and coordination, to executive director. “We have a lot of projects that are critical, that we are on the cusp of completing, and having a seamless transition in that leadership is very, very important,” board member Brandon Tucker said. “Gas prices rise in Florida but still below national average” via Kevin Derby of the Sunshine State News – AAA released a new study on gas prices across the Sunshine State … gas prices in Florida stood at $2.29 per gallon Sunday. That’s an increase of 8 cents from last week and is slightly below the national average of $2.31 per gallon, an increase of 3 cents from last week. At this time last year, gas prices in Florida averaged $2.18 per gallon and the national average stood at $2.15 per gallon. Mark Jenkins, a spokesman for AAA and the Auto Club Group, said that motorists should expect higher prices in the days to come as crude oil prices are higher than they have been in two months and Middle Eastern nations reduce the supply in August. “UCF placekicker gives up eligibility for YouTube videos” via Terrence Harris of The Associated Press – Donald De La Haye has made the decision to give up football rather than give up making advertising money from videos on YouTube that he produced … De La Haye did not accept the conditions of a waiver received from the NCAA and has been ruled ineligible to compete. The statement said UCF officials petitioned the NCAA on De La Haye’s behalf and got the governing body to allow De La Haye to continue to make money from videos that did not depict him as a student-athlete. But the YouTube videos that depict him as a student-athlete would have to broadcast on a non-monetized account. De La Haye, a marketing major, made several videos, some depicting his everyday routine and some that dealt with his experiences on the football team. Some of his videos had more than 50,000 views, though it is unclear how much money De La Haye made. Happy birthday to Rep. Jennifer Sullivan, Capital City Consulting’s Ashley Kalifeh, the Florida Squeeze’s Kartik Krishnaiyer, Daniel Nordby, our friend Brian Shuford, and Karen Unger.